Notification with the passing of NWA/DL pilot-Captain Edward Michael Mucha, age 58. Captain Mucha joined Northwest Airlines 03-06-1987 and flew for Delta Air Lines until January 2013. He is survived by his wife Patricia Smith Mucha. Edward Michael Mucha, age 58, passed away at home with family by his side on April 21, 2014, at 11 a.m., 15 months after a pancreatic cancer diagnosis. Originally from Pittsburgh, Pa., Ed accomplished much in his short life. After receiving a BS in chemistry and an MBA from the University of Pittsburgh, Ed joined the U.S. Navy Air Training Program. He served as a Navy Pilot, flying observation flights over the Atlantic Ocean and then continued as a Naval Reserve officer. 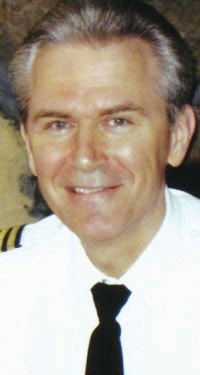 Following his active military career, he flew as a pilot-captain for Northwest Airlines until the merger with Delta and then continued to fly for Delta until January 2013. Preceded in death by his parents, Henry L. and Susan Smorag Mucha; he is survived by his wife of 30 years, Patricia Smith Mucha; three sons originally from Poland, Arthur (Kristina), John, and Gregory. He is also survived by his siblings, Susan of Pittsburgh, Pa., Tom (Susan) of Ft. Meyers, Fla., Gregory of Pittsburgh, Pa., and Joyce (John) of Anchorage, Alaska. Ed spent many years devoted to our country, first as a pilot in the Navy, then about five years ago, he picked up the activist banner of the "Veterans for Peace," whose mission is to abolish war and to expose the true cost of war. He believed our true nature is compassion but somewhere along the way we have gotten side-tracked. Ed chose to have his body donated for scientific research. In lieu of flowers, a donation to Veterans For Peace, www.veteransforpeace.org , or the Polaris Project, www.polarisproject.org , is what Ed would have liked.